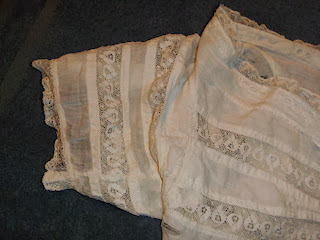 Lovely Victorian Edwardian Lace and Cotton off shoulder (?) 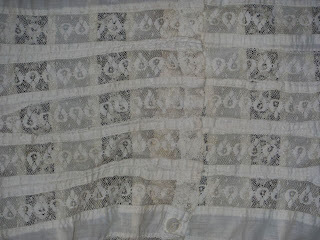 short blouse. I'm not sure if this is off shoulder because there are only the 2 bottom buttons and buttonholes for the blouse and then the upper part of it seems large, like it would be pulled toward the shoulders/arms to be worn. I showed it in the pics with the front together, perhaps a decorative pin was used to close it? 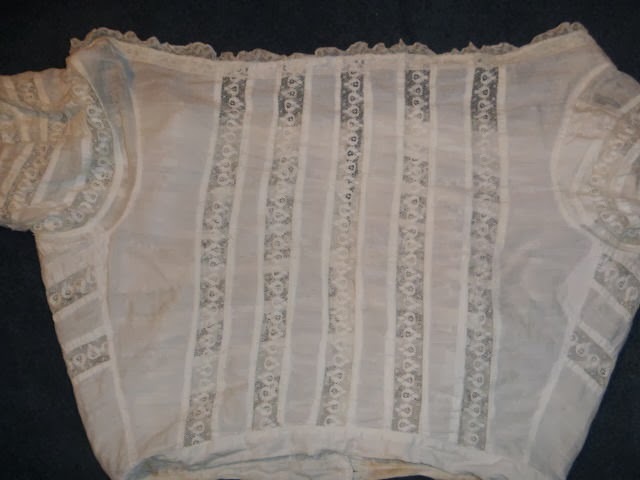 I don't know much about Victorian clothing to know exactly how to explain this one. 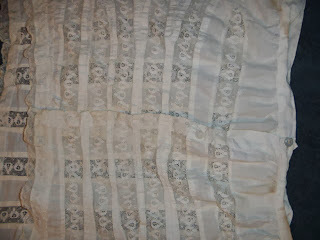 The waist laid flat measures for about a 25" waist. Also laid flat and with the front closing together, measures about for a 36" bust. Shoulder to shoulder measures about 20". 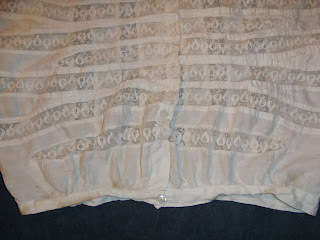 Length from the top of the back of the blouse to the hem is about 13". 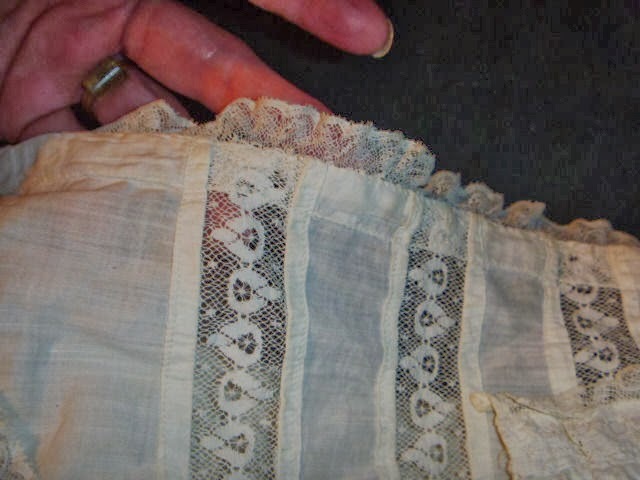 Along the bottom hem is yellowed and stained a bit, and there are a couple of age tears in the solid fabric as shown in the pics. I didn't notice any holes in the lace though. 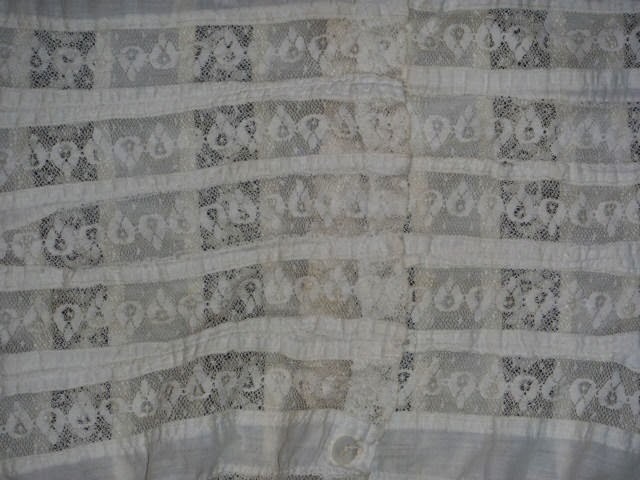 I'd love to know how this blouse was to be worn if anyone knows. Just for my own information. Please check out the pics for the rest of this description. Thanks for looking and have a wonderful day!!! Clearly, the seller had no clue when this was from nor what it is. Lace insertion to this magnitude is more common after the invention of the sewing machine. 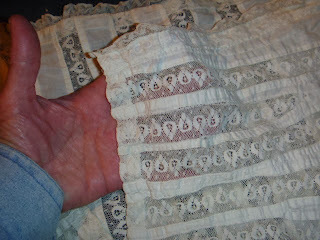 You can see the machine sewing in one of the pictures. The wide neck style was still common at the end of the 1860's. Given how short this is, I'm guessing around 1867/1868 for this corset cover.